This article was first published in AikidoEurope, the publication organ of the Europen Aikido Federation. The article was taken from the English text on the https://aikidosphere.com/nt-e-budo website. At present, many Budos are thriving in Europe as in America with more and more participants. For participants in Budo such as we this should be a cause for rejoicing. However all these Budos, so different one from another, which are appearing suddenly astonish me and leave me perplexed. I am not talking of the former Budos, which rediscover the light long since hidden, and which today are judged better than they were before. This on the contrary comforts and pleases me. But rather of the Budos which mix and add one martial art with another and which are full of the colors and mysterious perfumes of the orient. If it is true that man in society is constrained to change this society in order to adapt it for each generation because the world is in movement, it is as normal as changing techniques, culture, and civilization. It is the very condition for existence. So Budo equally may be changed in its form. But is it good to change a Budo so fundamentally? In Japan, one says that you cannot graft bamboo onto an ordinary tree. If by chance such a grafting should succeed what would be the result: a tree or bamboo? What would you call it? This proliferation of the martial arts in the West is to be explained perhaps by the fact that Westerners frequently do not have a good conception of the Budos. It is true that I myself am not capable of giving a good explanation of what a Budo is. The history of Budo is two thousand years old. During these two thousand years Budo, depending on the era, the region, the men, has certainly presented many faces. However, at the bottom of the heart of each Japanese lives today in our time a profound sense of Budo and as a Japanese, I can perhaps try to give you an explanation which may be of use to you. Originally BU = ways of armed combat; thus, the method of killing, the method of war. Later BUDO = way of maintaining peace, the method of awakening in men the sense of life. Combat has changed its aim. Is this quite certain? The origin of the word soldier is to be found with the Romans in the expression: he who receives salt, later he who receives pay, that is to say, who is paid for. In Japan, we say MONO NO FU the armed man. MONO = armed FU = man. With the same meaning TSUA MONO (TSUA = TSUBA). We also say MASURAO, a man of valor, of quality. Man of war superior to another warrior. Then with time, we arrive at Samurai or BUSHI, man of war of whom the principle characteristic is loyalty. 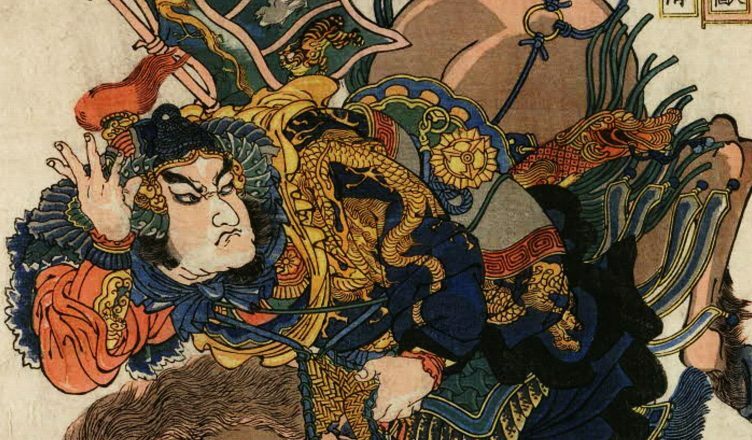 BUSHI, man of war whose loyalty lasts until the body is crushed and the bones become brittle. The study of Bushi is thus the defiance to death. His choice: death without regret, without attachment to life. The meaning of his life is in giving his life. To safeguard the life of the head of the household to which he belongs. Such is BUSHlDO or the path of BUSHI. For us, Japanese BUSHI is the perfect image of man. Let us continue our interpretation. In a society, he who bears arms is undoubtedly very strong. It would be easy for him to use this power to the detriment of others. Everyone normally has affection for himself. It is therefore difficult for him to master his ego to vanquish his desires. He must be strong. So it is that the Samurai or BUSHl must not only execute the martial arts but also have the profound qualities of spirit in order to be ever better. He must envelope himself like a second skin with moral culture. This everyone must be able to see, perceive. For we Japanese in fact, the Samurai is he who carries in everyday life the totality of qualities acquired. Thus the Samurai approaches well the perfect type of man. Merely to be physically strong, skilled at arms, signifies nothing important. The attitude, the general bearing characterizes even in defeat the true SAMURAI. Thus in the middle ages after losing a war or surrendering a castle the lord would sacrifice himself and his own family on condition that his people and his subordinates be spared and remain free. In the second world war, the Emperor of Japan on meeting general MacArthur offered him, as the person responsible, his life and that of his family asking him not to harm the Japanese. Nevertheless, he had been opposed to the war from the beginning. Such actions are for us BUSHlDO or the way of BUSHI. Is this clear? Let us touch upon another aspect of the question. In Europe, at the present time, many would translate BU as stopping the spear. However, the original sense of BU is translated as spear and foot; a combination of spear and foot. Thus someone who holds a lance before his foot; attitude of a man standing holding a spear, the feet foursquare on the ground, symbol of a strong man, physically strong and armed. Armed in the service of others, the country, for example, guardian of the country if you will. With this picture of the total giving of self is for the Japanese the symbol of the true man. I will explain myself and emphasize further. Animals have teeth, claws, hooves; men have the katana, the spear; bows and arrows. To use them for oneself is to behave as the animals; to use them for peace, not for oneself is, if you will, the way of the man. It is in this sense that BU has been translated by “stopping the spear”. But to receive blows without being able to protect oneself is not BUDO, one may not in this case say BUDO. If soldiers cannot defend their country what will become of the population? During the last war, Norway had an army of thirteen thousand men and eighty old aircraft, a deplorable military situation. The German army occupied Norway in three days. During that same period Switzerland, a neutral country, had one hundred and eighty thousand soldiers, a hundred and twenty aircraft of recent type, and another hundred and twenty thousand older and well-trained soldiers. That was the reason for which Hitler turned towards Norway. The BU of a country, the BU of everyone must be constantly served. We say symbolically that one must always be ready to remove the sparks that fall on the body. One must guard this capacity of intervention. To hold the gun, defend the weak is the image of the man. But if the necessity to use this gun does not present itself it should not be used, never for the satisfaction of the ego. The good falcon keeps his claws withdrawn. We have in Japanese two expressions: — SATSU JlNTO: saber which kills, which takes life — KATSU JIN KEN: saber which gives life. It is the same saber, it is the man who uses it. To kill within oneself the desire to kill equals saving the life of someone. This is the meaning of KATSU JIN KEN. It is I believe the meaning which O-Sensei gave to: LOVE. The BUSHl has the courage to strike anyone, anything, anytime, anywhere, anyone evil or himself. That is certainly the true meaning of love and to possess this meaning of the word love makes the BUSHI, that is to say, someone who can use equally well SATSU JlNTO or KATSU JIN KEN thus someone who can kill if necessary. If one does not possess this faculty KATSU JIN KEN means nothing. It is the same on the technical plane. Study leads to it. It is BUDO which makes the BUSHI. I should not like you to be mistaken on this subject. By BUDO with the work of Bujutsu one forges the man of strong personality. We say therefore the BUDO way, abandonment of self to SERVE. BUDO discovers the ONE, discovers UNITY, Peace amongst Men. JlNMU is the name given to the first emperor of Japan. JIN = God, MU = Bu which translates as emperor of the country of the MARTlAL ART. 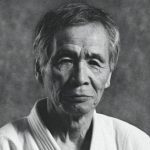 We must not understand martial art as meaning the art of war but in the sense of warrior and God as one, having realized the ONE belonging to God and possessing martial power. Such is the profound thought of the Japanese whence this name was given to the Emperor. Such is the true BUDO which proposes apparent contradictions: skill at arms made to kill and which construct a harmonious world, light, clean and just. Make the two as ONE. I hand over these talks to your reflection. Picture: It was edited from Utawaga Koniyoshi’s Botsu’usen Chosei (1827-1830) named piece.